Note. This section contains information from the original guide. The Open Graph standard is developed by the Facebook social network. It allows you to manage the site preview when the link to the site is posted in social networks and pass the information to other Internet services. Open Graph markup is used by Facebook, VK, Google+, Twitter, LinkedIn, Pinterest and other services. In Yandex, Open Graph is used to transfer data to the Yandex.Video service and to generate a snippet header. The Yandex.Video service recognizes not only basic tags but also other meta tags, such as different types of video (series, music videos, movies, and so on), or age and country restrictions. Depending on the chosen type, you can specify additional properties of an object: movie title, the number of the episode, TV show release date, and so on. 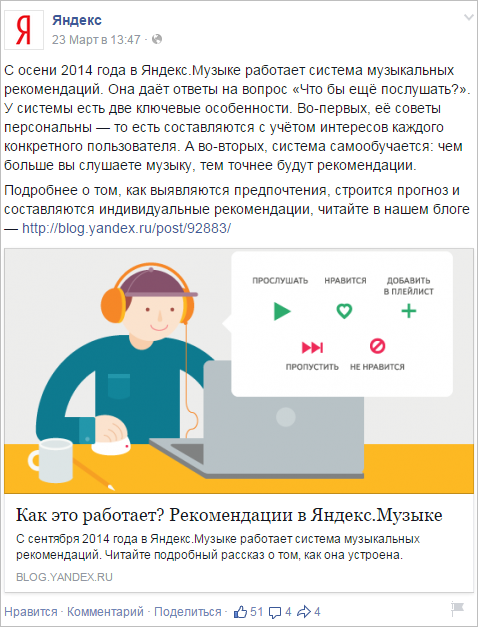 As Yandex.Video needs meta tags that are not present in Facebook documentation, the service uses an extension. In addition to building previews and snippets, the Open Graph standard can be used by application developers to publish user activities on Facebook. In such publications, you can specify the user, object, actions with this object and the application used to complete this action. og: type — Object type, for example: video.movie (movie). If you have multiple objects on the page, select one of them (the main one). Depending on the type, you can specify additional properties. og:image — The URL of the image describing the object. og:url — The object's canonical URL that will be used as a permanent ID. og:audio — URL of the audio file corresponding to the object. description — Short object description. og:determiner — A word (article) to be put before the object name in a sentence. Can be indicated as: a, an, the, "", auto. If the value is specified as auto, the service reading the markup will choose between a and an values. If no value is specified, there will be no article before the object name. og:locale — The language of the object description set in the language_country format. The default value is en_US. og:locale:alternate — An array of additional languages in which the object description is available. og:site_name — The name of the site where the object information is placed. og:video — The URL of the video file corresponding to the object. Some meta tags can have additional (optional) metadata. Such meta tags contain the additional : (colon) character. og:image:url — The URL of the image describing the object (corresponds to og:image). og:image:secure_url — Additional URL if the page is opened using the HTTPS protocol. og:image:type — Image MIME type (image format by MIME standard). og:image:width — Image width in pixels. og:image:height — Image height in pixels. If the meta tag can contain multiple values, add additional meta elements to the page. If there are conflicts, the data in the first meta element (top down) will be taken into account. Specify structured meta tags after the main meta tag. where the markup means that the page contains 3 images: the first one is 300 x 300, no size is specified for the second one, and the third one is 1000 pixels high. Global object types are grouped vertically. Each vertical line has its own namespace. The value of the og:type tag for the namespace always consists of the object type name and details (<object type:details>). This avoids confusion with the user-defined types containing the : (colon) character. music:duration (integer >=1) —Song duration in seconds. music:album (music.album, array) — Album title. music:album:disc (integer >= 1) — Disc number. music:album:track (integer >= 1) — Track number. music:musician (profile, array) — Artist name. music:song - music.song — Song title. music:song:disc (integer >=1) — Disc number (corresponds to the music:album:disc value). music:song:track (integer >=1) — Track number (corresponds to the music:album:track value). music:musician (profile) — The song artist. music:release_date (datetime) — Album release date. music:song — Corresponds to the music.song value specified in music.album. music:creator — Radio station creator. video:actor (profile, array) — Actors. video:actor:role (string) — Roles performed by the actors. video:director (profile, array) — Director. video:writer (profile, array) — Script writer. video:duration (integer >=1) — Movie duration in seconds. ovs:release_date — Movie release date. video:tag (string, array) — Tags (words, phrases) related to the movie. video:actor — Corresponds to the video.movie value. TV show. Markup corresponds to the video.movie value. Video that doesn't fall under any category listed above. Markup corresponds to the video.movie value. article:published_time (datetime) — Article publication date. article:modified_time ( datetime) — The date of the last changes in the article. article:expiration_time (datetime) — The date when the article expires. article:author (profile, array) — The author of the article. article:section (string) — Topic (section) of the article (for example, Technology). article:tag (string, array) — Tags (words, phrases) related to the article. book:author (profile, array) — Book author. book:isbn (string) — Book's unique numeric identifier (ISBN). book:release_date (datetime) — Book publication date. book:tag (string, массив) — Tags (words, phrases) related to the book. profile:username (string) — Nickname (username under which the user is registered). profile:gender (enum) — Gender (male, female). Has no values except for the main ones. Any page which isn't marked up is recognised as a site object. Can take true or false, 1 or 0 value. Time value. May contain date (year, month, day) and time (hours, minutes) according to the ISO 8601 standard.